Martin Austwick is a musician and singer-songwriter (Pale Bird, Martin Austwick, Dr Martin Austwick), and podcaster (Song by Song, Answer Me This!). He has written and performed music for a number of podcasts and live shows including The Allusionist, 99% Invisible and Third Coast International Audio Awards. Martin Zaltz Austwick is a specialist in data visualisation, mapping, and public engagement, and Honorary Senior Lecturer in Spatial Data Science and Visualisation at the Bartlett Centre for Advanced Spatial Analysis (CASA) at UCL. His research interests include visualisation and analysis of cycling systems, freight transportation, sharing economies, communities of practice, and pedestrian behaviour; and Digital Humanities, including corpus text analysis and collaborative mapping. 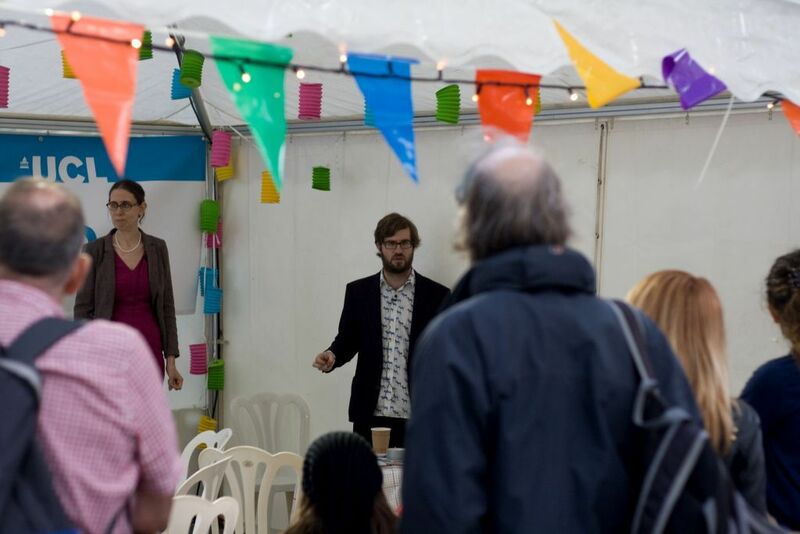 He has an active interest in public engagement through public talks, workshops, datavis, audio, blogging, and community engagement, and won the 2015 UCL Public Engagement Award for Institutional Leadership. Martin Zaltz Austwick is an expert in data visualization, programming, podcasting and public engagement, with an interest in cities and networks. Public engagement is central to his work through data and model visualisation, blogging, podcasting, public talks, video, music and a dedication to supporting and training others. In his spare time he is a musician, urban rambler and award-winning podcaster. Martin Zaltz Austwick is an award-winning podcaster (Radio Academy/Sony/Aria Gold for Answer Me This! in 2011; British Podcast Award 2017 for Song by Song). He’s co-created, presented and produced podcasts since 2007 including Answer Me This!, Song by Song, Brain Train, Global Lab and The Sound of The Ladies, and created music for the above and The Allusionist, The Beef and Dairy Network, Mortified, Sound Women and Why Are Computers?. He’s provided podcast training to HEFCW and UCL, co-ordinated maker events as part of the London Podcast Festival, and judged in the Radio Production Awards. He’s released five albums and several EPs of original songs as Pale Bird, (Dr) Martin Austwick and The Sound of The Ladies. Dr Martin Zaltz Austwick is a Senior Lecturer and Course Director of the Spatial Data Science and Visualisation Masters degree. He holds an undergraduate Physics degree and a PhD in nanotechnology and quantum computing, and worked as a clinical medical physics researcher from 2006-2010, a varied career which has led to his interest in the adaptation of ideas from the physical sciences to social sciences. Dr Zaltz Austwick has a strong commitment to public engagement, through visualization, podcasting, blogging, public talks and workshops and social media, and has shared in Radio Academy Gold and Silver Awards. In 2016 he was the winner of the UCL Public Engagement Award for Institutional Leadership, and shared in the 2015 UCL award for Public Event at the UCL Communication and Culture Awards. Martin Zaltz Austwick works on visualisation and analysis of human data, frequently with a strong spatial component. His visualisation frequently utilises Processing to create animated visualisations of spatial movement (for example, Bike Share Schemes in a number of cities, GPS tracks drawn from pedestrian movement in London, and shipping movements around the globe). Since 2016, he has been Co-Investigator on the EPSRC FTC2050 project, analysing and visualising freight delivery in central London. In his role as Associate Director at the UCL Centre for Digital Humanities, Dr Zaltz Austwick works on visualising and analysing spatial data drawn from history, the arts, and other branches of the humanities. He is currently Co-Investigator on the AHRC-funded Survey of London: Whitechapel grant, a project embedding Architectural History in an interactive web map, allowing users to learn about the area and contribute their own stories and accounts. In 2016, he co-published a corpus text analysis of the REF2014 Impact Case Studies to understand classes of Impact in UK Research, and contributed to a project analysing a large British Library text corpus to find historical trends in the description of trades, disease, and geography. Dr Martin Zaltz Austwick is a Senior Lecturer and Course Director of the Spatial Data Science and Visualisation Masters degree. He currently leads Masters-level modules in Programming for Architecture and Design and co-leads a module in Digital Visualisation, and an undergraduate BASc module in Data Science. He has delivered lectures on Data Visualisation for the Faculty of Engineering and the SEAHA Doctoral Training cohort, and lectures on podcasting for the MAPS faculty. Martin has delivered external training on Data Visualisation, Podcasting and Mapping for ARUP, the UK Home Office, The British Library and HEFCW, and spoken at the Boring Conference, TEDx LSE, Bright Club, Science Showoff, Pint of Science, SciBar and DorkBot, as well as academic conferences.